The Panama Canal - one of the seven wonders of the modern world - a vital artery nourishing the world economy. Today, June 26, 2016 Panamanians will inaugurate their historic accomplishment of an expansion tripling the Canal's capacity. The larger locks allow the huge "neo-Panamax" ships to navigate and move greater quantities of cargo. Panama has invited 70 heads of state to celebrate as a Chinese container ship will be the first commercial vessel to transit the new locks. 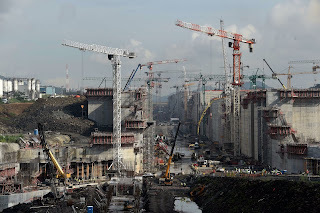 The third set of locks, a massive engineering feat taking 40,000 workers almost 10 years to dig and build with an enormous investment of over $ 5.4 billion. It is hoped the Canal's ( the nation's life blood ) expansion will cast a more favourable light on the country where scandal, and the Panama Papers have recently tarnished and embarrassed officials. ride the railway line adjacent to the canal - opened in 1855, and in April 2016 enjoy full transit of the Panama Canal aboard the NCL Norweigan Pearl. The tariff schedule for passage was $ 138 per cabin and on April 14, 2010 the Norweigan Pearl cruise ship paid the most expensive toll on record of $ 375,600 US . The lowest toll ever paid was 36 cents, by American Richard Halliburton who swam the Panama Canal in 1928. Spain's Vasco Nunez de Balboa was the first person to navigate the Isthmus of Panama in 1513, this was the start of a number of different countries looking to connect the two Oceans. Despite the best efforts of the Spanish, Dutch, French, British, and Americans it was almost 400 years later before it became a reality. Inspired by the diplomat Ferdinand de Lesseps with funding raised from the huge French profits generated from the successful Suez Canal, France began working on a sea level canal in 1881. Facing the daunting challenges of a 35 ft rise, and the raging torrents, of the Chagres River during the rainy season, and dense jungle alive with venomous snakes, insects and spiders, many workers died. Public health measures were ineffective because at that time the role of the mosquito as a carrier of disease was unknown. Conditions were downplayed in order to recruit workers however the high mortality rate made it very difficult to maintain an experienced workforce. The Culebra a main cut through the mountain was plagued with landslides, the side slopes had to be reduced to minimize the repeating landslides. The american steam shovels used in the construction, and mechanical and electrical equipment with limited functionality rusted rapidly in this tropical climate. After reportedly spending $287,000,000 US the effort declared bankruptcy in 1889 wiping out the savings of 800,000 investor's. In 1894, a second French company, the Compagnie Nouvelle du Canal de Panama, was created to take over the project. A minimal workforce was employed to keep equipment in salable condition. The sea level engineering concept was challenged. Five years later due to engineering problems and the high worker mortality rate the project came to an abrupt halt. With the support of the United States, Panama declared independence from Gran Columbia on November 3, 1903. On February 23, 1904 a treaty was signed granting the U.S. rights to build and administer the Panama Canal Zone. This quickly became a contentious issue between Colombia, Panama, and the United States. The United States acquired the equipment from the French for $ 40 million US, and the rights from Panama for $ 10 million and tookover. Despite many drawbacks and conflicts, the 50 mile Panama Canal initially opened in 1914 - 102 years ago - enabling ships to avoid the lengthy and hazardous Cape Horn route around the southernmost tip of South America via the Drake Passage or Strait of Magellan. It also decimated South American ports large ship traffic. Indeed an engineering marvel with a dark history where 25,600 workers lost their lives to cholera, malaria, and yellow fever in the dense jungle. This engineering shortcut, saving 7,872 miles, between the Atlantic and the Pacific Ocean took 34 years and over 100,000 workers to complete. The government owned Panama Canal Authority took operations over from the US in 1999 and now employs 9,000 people. In this small country dominated by " old money elite " the authority is a power house centre within the government. It oversees daily operations, oversaw the design of the new locks and chose the winning bidder. The canal has served over 900,000 vessels in its life. dredging operations, watershed management, information systems and traffic control. In order to navigate the canal a ship must pay a toll averaging $ 54,000 US in cash two days before entry ( no Visa or Mastercard ). As a result there are over 180 international banks in Panama City. We understand this is the most banks in any city in the world. It takes 8 to 10 hours for a ship to pass through the Panama Canal. The canal consists of artificial lakes, several channels, and three sets of locks. Locks raise the ships 85 feet to the world's largest man-made Gatun Lake. The lake which supplies the water to operate the locks also supplies the countries drinking water. Moving each ship through each lock takes 52 million gallons of water - the daily consumption of the entire city of New Orleans. All of the locks are filled and emptied simply by gravity, without the aid of pumps. Entering the Gatun locks cables are attached to approaching ships from electric locomotives, known as mules, that run on rails alongside each of the lock walls. These locomotives pull the ship into the lock chamber and bring it to a stop. The lock doors are closed and the water level raised to the required level . The cable winches keep constant tension so the ship is centered, ensuring safe and efficient passage. When the lock water level reaches the desired level the workhorse locomotives pull it into the next chamber. The Gatun locks has three chambers. Once the ship is raised the 85 ft it floats across the man-made Gatun Lake. 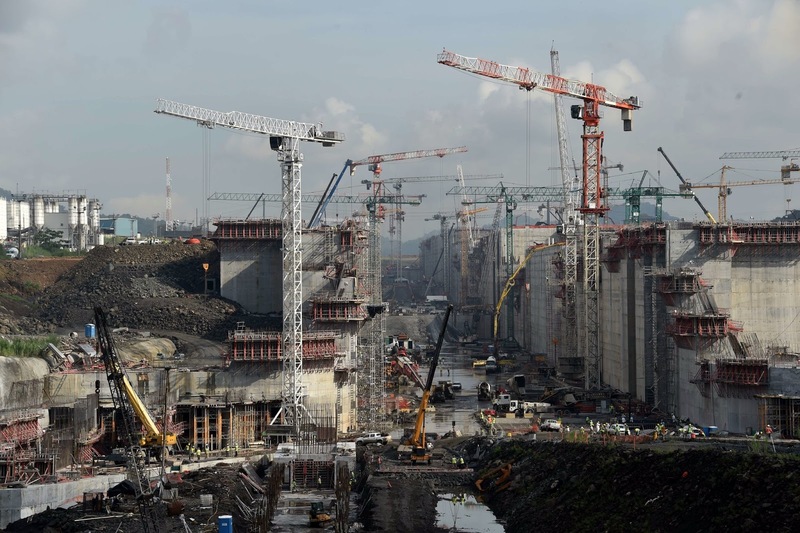 The level of the lake is controlled at the Gatun Dam both through a hydro-electric plant and spillways. If rainfall is sparse water is released from the Madden Dam on the Chagres River at Gamboa. During rare occasions, this spring's El Nino it has been extremely dry and with the lack of water it has been necessary to implement limitations on the weight ( resulting draft ) of transiting vessels. Ships then navigate the Culebra Cut through the continental divide and under the new Centennial Bridge. The Pedro Miguel single step lock begins the descent and two more steps / chambers in the Miraflora Locks lowers them into the Balboa harbour - back to sea level. A 13 km channel leads ships to pass under the Bridge of the Americas on their way to the Pacific Ocean. National issues such as infrastructure improvement and education have been set aside for this controversial International mega-project. The new canal lane will allow ships carrying nearly three times as many containers to pass. The ports of New York, Miami and Long Beach, Calif., have heavily invested in their own expansion projects to receive the neo-Panamax container ships. Remaining ports are scrambling to expand to be able to handle these ships as well. The original opening date was delayed several years and several ships have already been specifically delivered in anticipation. Environmental challenges faced included unstable soil, torrential downpours, and the 17 foot difference in tides between the Pacific and Atlantic, current El Nino water shortages. Engineering challenges faced included the quality of concrete, operation of the tugs delivering the large boats through, and the tight squeeze where the new 1,400 ft long locks need to hold a 1,200 ft long ship along with two 100 ft long tugboats fore and aft. The timing of the expansions opening is in the midst of a shipping industry slowdown linked to China's faltering economy and sagging global demand. Around 90% of the world's goods travel by sea. It will cost shippers an estimated $800,000 for a neo-Panamax vessel's passage through the canal. In early June, under sunny skies, the Baroque made history with a test pass through all three new Agua Clara locks before anchoring in Gatun Lake. The Spanish tug Cerro Santiago lead the way. The applause on shore was acknowledged with blasts from the ship's horn. Well worth visiting, the Panama Canal is one of the signature public works of the 20th century. Larger, powerful winches with robust pull cables area unit capable of moving things deliberation many thousands of pounds! looking on the sort of activity that the winch are used determines the strength and sort of winch that may ought to be purchased Click Here.